Lot 130: CD 136 B & O / W. BROOKFIELD Color: Limey Apple Green Description: Shallow 3/8" skirt flake, otherwise about very, very near mint! Somewhat crudely made with some swirls in the skirt and a neat 1/2" black inclusion in the glass with an associated factory stress mark. 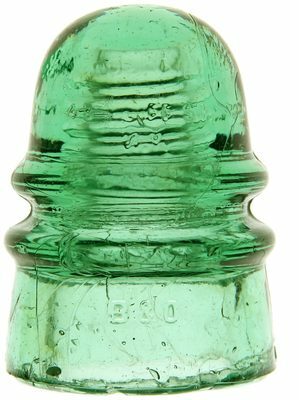 Made for the Baltimore and Ohio Telegraph Company by Brookfield, most of the green CD 136's were reportedly found along the Santa Fe Railroad in Texas! They rarely come up for sale so here's your chance!